We returned to Georgetown like to an old friend, happy to soak in familiar faces and places, but also excited to revisit some of our favorite restaurants and eager to try the ones we had missed the last time. 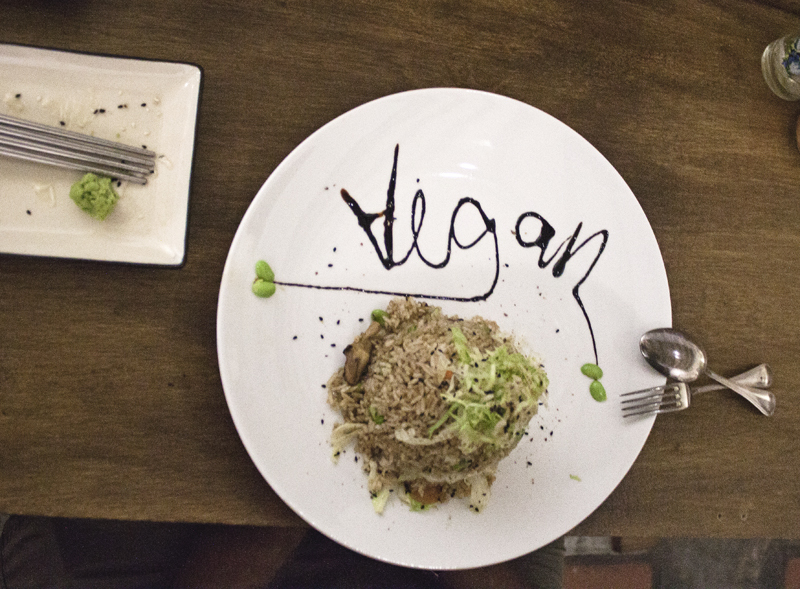 Penang is possibly the #1 foodie destination in Malaysia, and fortunately vegans and vegetarians are not left aside – Happy Cow has 111 listings for vegan and vegan-friendly restaurants on Penang Island! We’ve compiled a list of the ones we have visited and enjoyed. You can read about our first visit to Georgetown here. This is hands down my favorite restaurant in Georgetown, and I say that based mostly on the laksa. For some reason, we completely missed this restaurant on our first visit to Georgetown, possibly because we thought it was far from the Old Town, but from the westernmost end of Chulia Street, it’s no more than a ten minute walk, or 5-6 minutes from the Komtar. The laksa here is simply SUPREME, and, unlike any other laksa I have previously tasted, it has a sour component to it, no coconut milk and loads of pineapple chunks (I think it’s the Penang laksa variation). It is bursting with the flavorful elusive herb known as daun kesum, also called laksa herb, Vietnamese coriander or Vietnamese mint. The laksa here is mastered to perfection and no visit to Penang will be complete without a taste of it, whether you are a vegan or not. Also noteworthy were the satays and the lotus rice. I would however skip the fried tofu cubes and the golden rolls – greasy and just not that interesting. 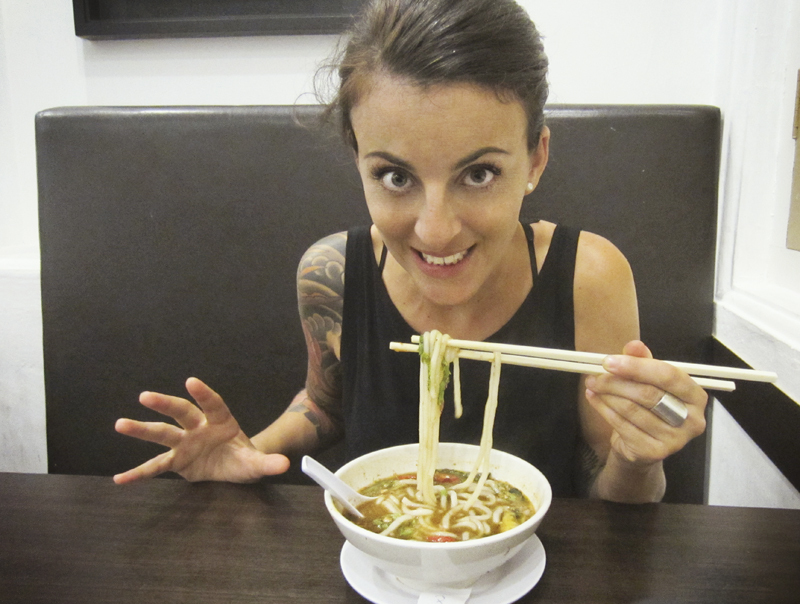 Some of the best, freshest Chinese Buddhist ‘Jay’ or vegan eateries we’ve been to. The self-service buffet overflows with piping hot al dente veggies and all sorts of mock meat and fish that were surprisingly good (I’m not a fan of mock meat) – we’ve discovered that mock fish in Malaysia is really delicious, a chewy tofu inside and lots of seaweed on the outside – a whole lot better than it sounds, anyway. Fill up your plate and pay-by-eyeballing from what I gathered. You can sit and order a drink next door, but unlike other reviews we’ve read, there wasn’t any à la carte option available. Closed on Thursdays. Japanese organic vegan restaurant that looks very unassuming from the outside, but the inside has a cool, laid back, kind of grown-up hostel-like vibe. The cafe uses no onion, garlic, msg, white sugar, white salt, artificial coloring or preservatives and claims to soak all the veggies in enzymes for 45 minutes (?). I had a rice porridge with a ton of veggies, Richard had the edamame fried rice and we also shared 2 different kinds of sushi, all of which were absolutely delicious. This isn’t your usual cucumber and avocado rolls, the flavors are complex and the variety of sushi on offer is exhaustive and surprising. Really awesome, and great service. Vegan “economy rice” very similar to EE Beng, a short bus ride from the Old Town (bus 101, ask to get off at the Adventist Hospital). Good fresh variety of food and fair prices (everything is actually priced, no eyeballing at the checkout like EE Beng). 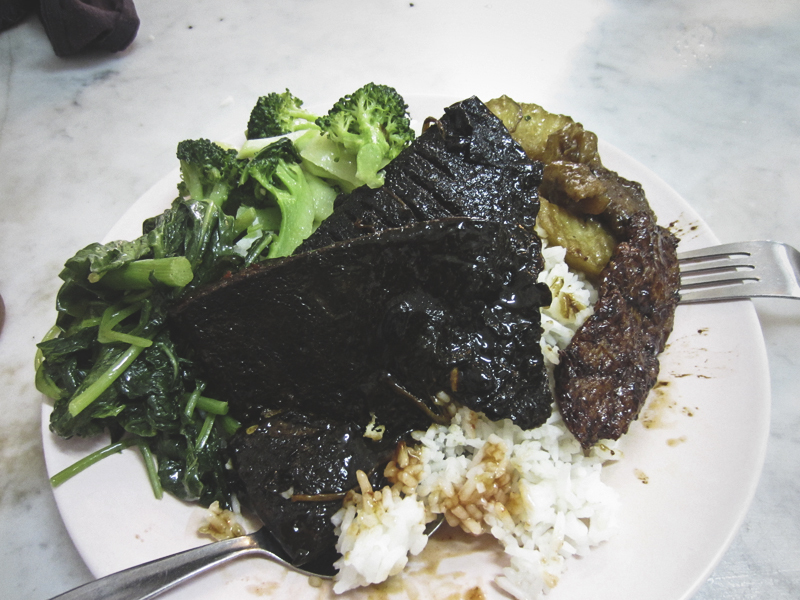 We loved the tempeh and mock fish wrapped in seaweed (some daun kesum herb in there – mmmm!) Good dessert selection too. A la carte vegetarian eatery offering traditional Malaysian specialties as well as some western food. 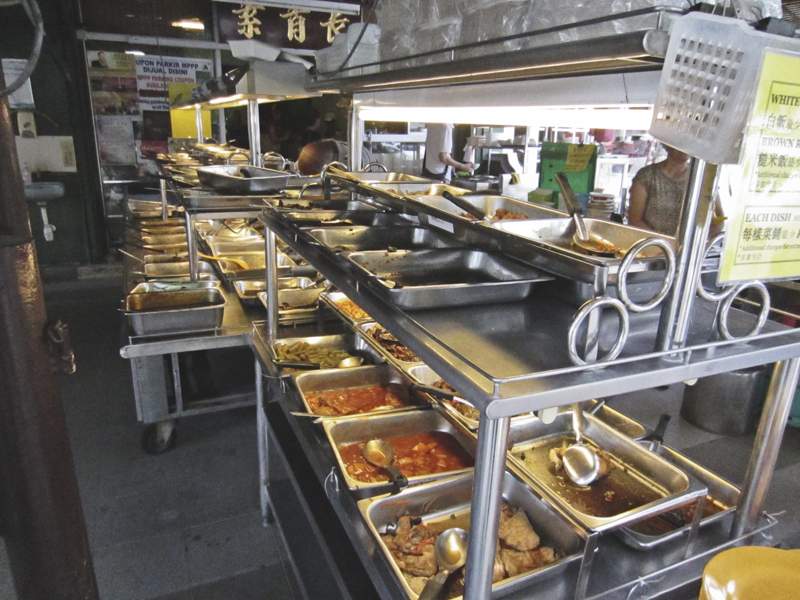 We ordered the laksa, rojak and nasi kendar on our first visit and everything came disconcertingly fast – within 1 or 2 minutes – but was fresh and piping hot – I was reminded of the food pellet instant chicken from “The 5th Element”. The laksa was spicy, like hiccup and heartburn inducing, eye-watering spicy (and for the record we both love very spicy food), but was really delicious, albeit lacking in daun kesum herb, the raison d’être of laksa. The rojak could have used a little tartness as it was mostly just sugary sweet. On a second visit, we tried the fried chicken which tasted quite a lot like McNuggets (especially so that they had sweet and sour dipping sauce!) which was the best freaking thing in the world because I was quite hormonal. We also had the satays which were a little undercooked but accompanied by a delicious spicy dipping sauce, and the char kway teow, a traditional noodle dish that usually contains a ton of meat and fish, and that was tasty and charred as you’d expect. As a whole, I’d say that it was a little hit and miss, but the prices were so low that I would definitely return to try more dishes. We stumbled on this little Chinese vegan place by accident for breakfast on our way back from the Thai consulate one day. We each had a bowl of the lo mee noodles from the noodle cart out front for 4RM ($1,30) and it was really good. There’s also a self service buffet at the back. Friendly and helpful staff. Come early for optimal freshness. Very clean neon-lit cafeteria-style Chinese restaurant. They serve a mostly vegan menu, but dairy is used on occasions, so ask to be sure. Most dishes are for sharing, but they have a few one person dishes, notably the set meal for 13RM, a nicely presented sample plate of various little veggie and mock fish dishes. It comes with Chinese tea, soup and dessert — that day it was peanut and lotus root soup and sweet potato and barley in syrup. We also ordered a side of satays that were surprisingly delicious. The owner surprised us with a plate of rambutans from her garden. It all felt very fancy. 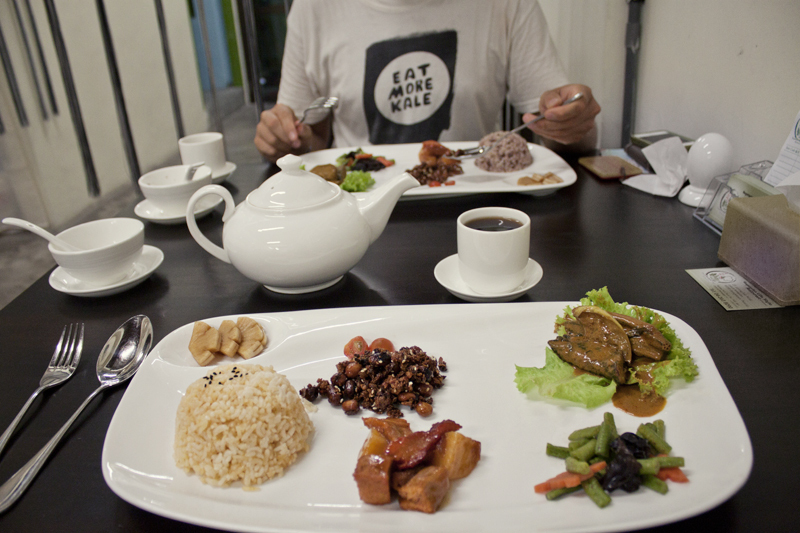 There are a lot more vegan and vegan-friendly restaurants in Penang that we wanted to try, but that will have to be on another visit! 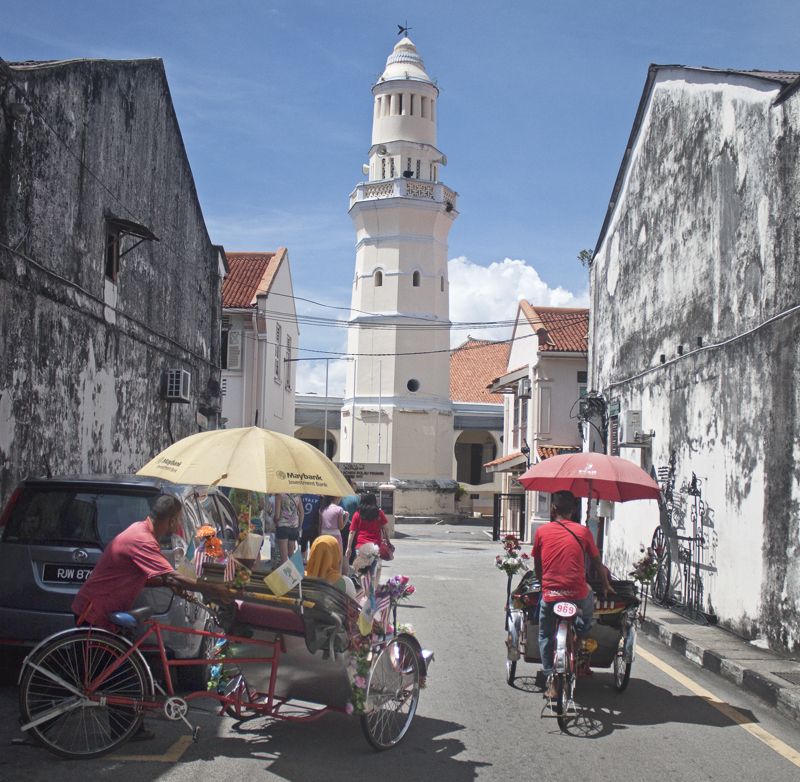 Check out Hungry Ang Mo for in-depth reviews of several restaurants in Penang. This entry was posted in Asia, Malaysia, Travel on January 9, 2015 by Amélie. Wow, this is perfect and exactly what I need! 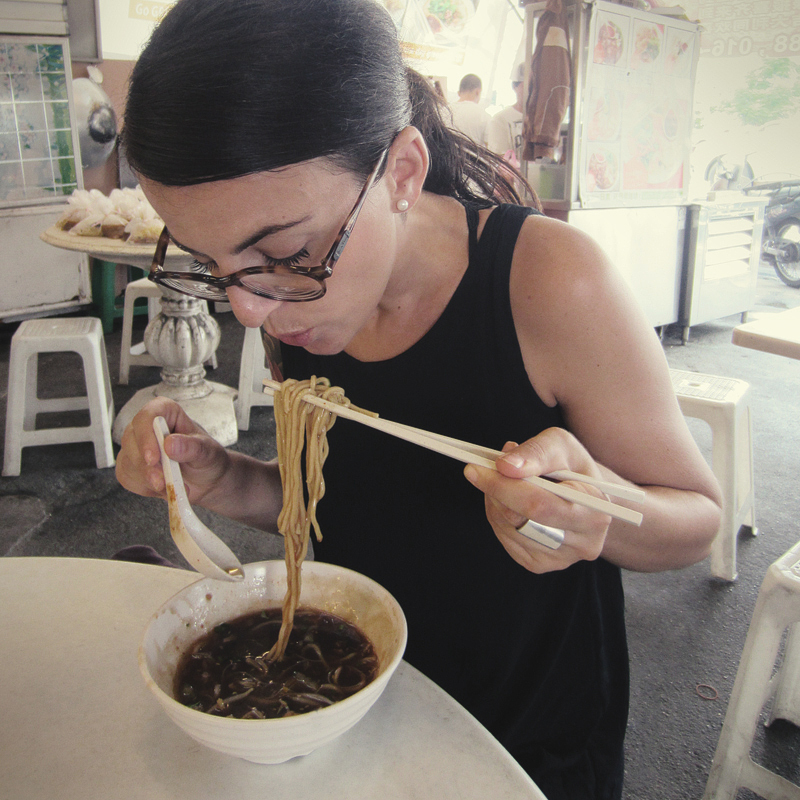 My husband and I are planning to visit Malaysia later this year and we’ve heard that Penang is the foodiest place in the country, so it’s great to know there are so many excellent vegan options! So glad I found your site – looking forward to following your journey, Amelie! I loved EE Beng! I’m always up really early when I’m away from home and a whole bunch of cats lived across the street to entertain me until the eatery opened at 7am. Laksa is one of my favourite dishes ever, your one looks fab! Shame we missed so many of these places whilst in Georgetown, unfortunately we weren’t vegan yet at that point, shame because we clearly missed out! Hiii. Love your article! Can I have the exact location/address for the 7th places? VEGETARIAN LIFE STYLE. It looks awesome! Life Style Veggie sudah tutup kedai(close shop) lor. It’s formally near the junction of Macalister Road and Penang Road. Awesome list here. I’ve rented a place 600 metres from the Laska place (no.1 on list). Literally going there now! Great article! 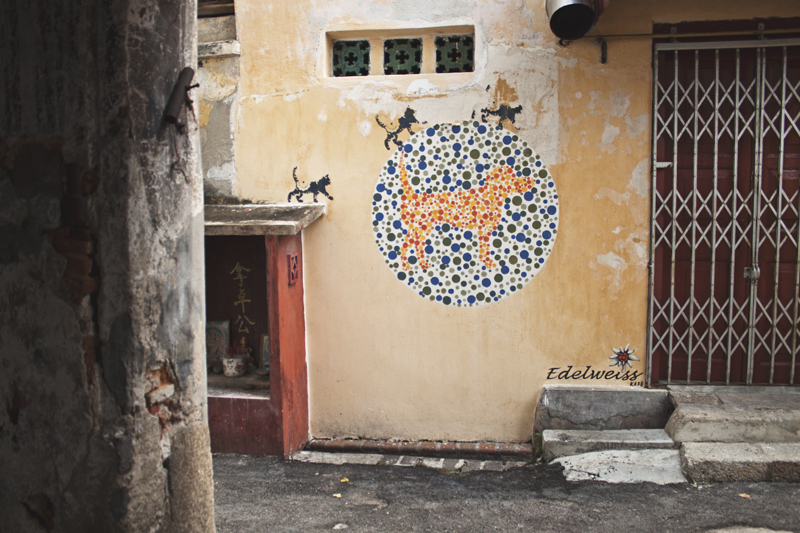 We had an amazing time eating our way through all the amazing indian vegan food in Penang earlier this year, and we actually wrote a post about it https://veganswithappetites.com/south-indian-food-in-georgetown-penang/ . But now we realize that we probably have to return just to try all the amazing Chinese food 😀 Thanks for the inspiration!